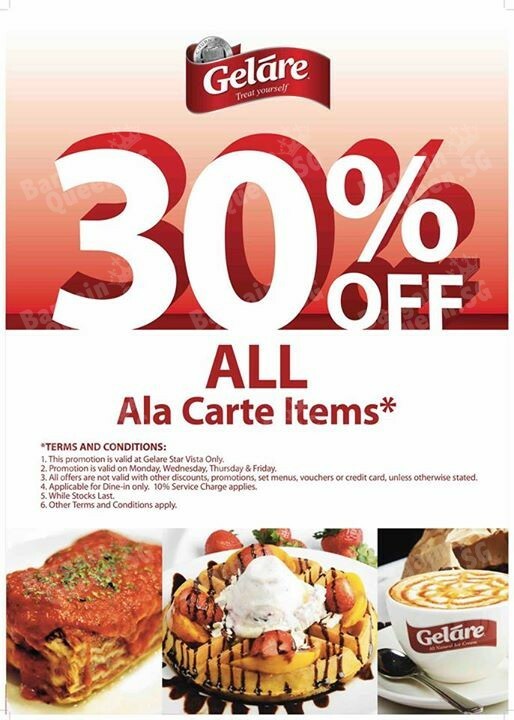 Geláre Star Vista is having 30% of A La Carte items! Hurry and make a trip down. Valid on Mon, Wed, Thur & Fri. This promotion is valid at Gelare Star Vista Only. Promotion is valid on Monday, Wednesday, Thursday & Friday. All offers are not valid with other discounts, promotions, set menus, vouchers or credit, unless otherwise stated. Applicable for Dine-in only. 10% Service Charge applies.